Within any deep geothermal project, the highest risk is in the drilling, both economically and safety-wise (e.g. Stober and Bucher 2013). This especially applies to deep geothermal projects in basins with very deep target sections and with only a few wells being drilled per year, such as the North Alpine Foreland Basin in SE Germany. Quite often, the effective implementation and continuation of a deep geothermal project depend on the success of the first well drilled. Therefore, most deep geothermal projects are similar to classical wild cat exploration situations in basins such as the North Alpine Foreland Basin in SE Germany. Unexpected changes in pore pressure and subsurface stresses can lead to severe drilling problems such as influxes, kicks, blow-outs, drilling fluid losses, differential sticking, over-pulls, etc., which in the best case only delay drilling and cause economic burdens, but in the worst case endanger the continuation of the project or even pose a significant safety risk (Mouchet and Mitchell 1989). Therefore, careful well planning and adequate prediction of subsurface stresses and pressures are crucial for a successful completion of deep geothermal projects and deep drilling in general. This is particularly valid in overpressured basins (Mouchet and Mitchell 1989). Overpressure is defined as the excess pressure above hydrostatic pore pressure given by a vertical depth, the formation water’s density and the Earth’s gravitational acceleration. Overpressure or pore pressure in general can be estimated from data sources such as geophysical well logs (Bowers 1995; Eaton 1972, 1975), seismic velocities derived from vertical seismic profiles, seismic surveys or sonic logs (Bowers 1995; Eaton 1972, 1975), drilling parameters (Mouchet and Mitchell 1989) and basin modeling (Bjørlykke et al. 2010; Darby et al. 1998; Karlsen and Skeie 2006; Mosca et al. 2018; Mudford et al. 1991; Peters et al. 2017; Satti et al. 2015). Origins of overpressure include disequilibrium compaction through retarded dewatering of pore fluids due to low-permeability barriers in the context of high sedimentation rates (Osborne and Swarbrick 1997; Swarbrick and Osborne 1998), fluid expansion through increased temperatures (Osborne and Swarbrick 1997; Swarbrick and Osborne 1998) or an increase in pore water caused by diagenesis (temperature) related hydroxide loss of clays (Osborne and Swarbrick 1997; Sargent et al. 2015; Swarbrick and Osborne 1998). Additional overpressure can be induced in extensive, laterally amalgamated and dipping sediments through lateral pressure transfer (Lupa et al. 2002; Yardley and Swarbrick 2000). Within the North Alpine Foreland Basin in SE Germany, overpressure is known to generally increase with burial depth from north to south and towards the Alps (Drews et al. 2018; Müller et al. 1988). Particularly to the south and east of Munich, overpressure can reach significant pressure gradients that translate into equivalent drilling fluid densities (mud weight) of 1.8 g/cm3 or more (Drews et al. 2018; Müller et al. 1988). Overpressure in the North Alpine Foreland Basin in SE Germany has been previously studied by Rizzi (1973), who demonstrated with two examples that overpressure can be estimated from geophysical well logs such as electrical resistivity and acoustic transit time (sonic log). Müller et al. (1988) and Müller and Nieberding (1996) were the first to study the regional distribution of maximum overpressure and its origin, based on a combination of maximum drilling mud weights and the structural interpretation of 2D seismic cross sections. They presented a regional map of maximum pore pressure gradients inferred from maximum drilling mud weights. Based on analysis of drilling data and velocity data, Drews et al. (2018) demonstrated that overpressure can be estimated with reasonable accuracy from seismic velocities of sonic logs and vertical seismic profiles. Drews et al. (2018) also were the first providing pore pressure gradient maps for all overpressured stratigraphic units present in the North Alpine Foreland Basin in SE Germany. However, previous works by Müller et al. (1988), Müller and Nieberding (1996) and Drews et al. (2018) were either based on drilling mud weight data and/or 1D velocity data of hydrocarbon wells, but did not incorporate 3D geologic models. Furthermore, these studies did not include any more recent deep geothermal wells from the North Alpine Foreland Basin in SE Germany, despite several deep geothermal wells have been drilled in the overpressured part of the basin during the past 2 decades. A recent example of a deep geothermal exploration well in the overpressured section of the North Alpine Foreland Basin in SE Germany is given by the Geretsried Deep Geothermal Project, approximately 30 km SSE of Munich. In this study, the predictability and controlling factors of overpressure in the greater Geretsried area will be analyzed, combining drilling- and velocity data-based well analysis and pore pressure-centric 3D basin modeling. The results will be compared with pore pressure indicators from drilling data and a pore pressure estimate from vertical seismic profile data of the Geretsried GEN-1 well. The integration of these methods is the first of its kind in the North Alpine Foreland Basin in SE Germany, especially in the context of deep geothermal projects in South Germany. 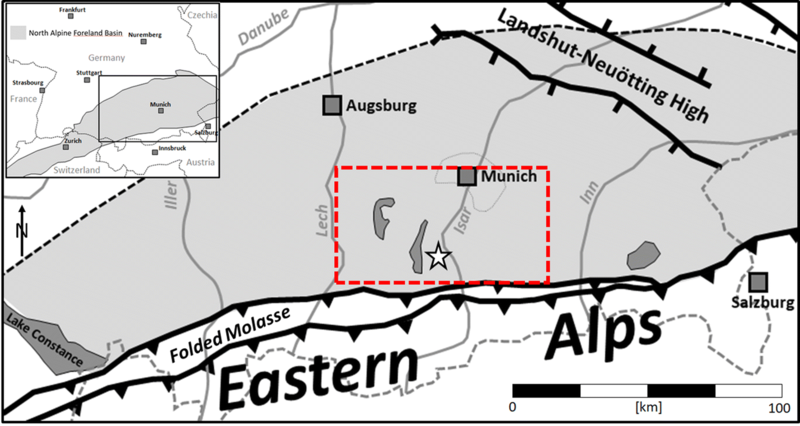 The results of this study are of great relevance to planning and drilling of future deep geothermal wells in the North Alpine Foreland Basin in SE Germany. Quantification of overpressure is also of great significance to geomechanical studies in the North Alpine Foreland Basin in SE Germany, e.g., considering the prediction of induced microseismicity caused by geothermal exploitation. In addition, the presented methodology and results will be a valuable reference case for other pore pressure studies to investigate overpressure distributions and mechanisms in sedimentary basins with a combination of different methods and from limited data sources. The North Alpine Foreland Basin is a classical peripheral foreland basin. Its part in SE Germany stretches from Lake Constance in the west to the Austrian border in the east (Fig. 1). To the north, the extent of the North Alpine Foreland Basin in SE Germany is roughly outlined by the Danube River, and towards the south, it is bounded by the thrust-front of the Subalpine Molasse or Folded Molasse (Fig. 1). The wedge-shaped North Alpine Foreland Basin in SE Germany is filled with Cenozoic (Late Eocene to Late Miocene) sediments, which overlie Mesozoic pre-Molasse strata (Fig. 2). The target for the geothermal utilization is the highly permeable aquifer in the Upper Jurassic carbonate sediments, which are generally under- to normally pressured (Lemcke 1976). The presence of overpressure in the North Alpine Foreland Basin in SE Germany has been attributed to disequilibrium compaction due to sedimentation rates exceeding dewatering rates of the buried fine-grained sediments (Drews et al. 2018; Müller et al. 1988). According to previous studies (Allen and Allen 2013; Zweigel 1998), peak sedimentation rates around 300 m/Ma occurred during Chattian and Aquitanian times. During the Cenozoic basin fill, fine-grained sediments forming shales and marls were primarily deposited during the high-stand phases in the Oligocene (Rupelian and Chattian) and Lower Miocene (Aquitanian) (Fig. 2) (Kuhlemann and Kempf 2002). 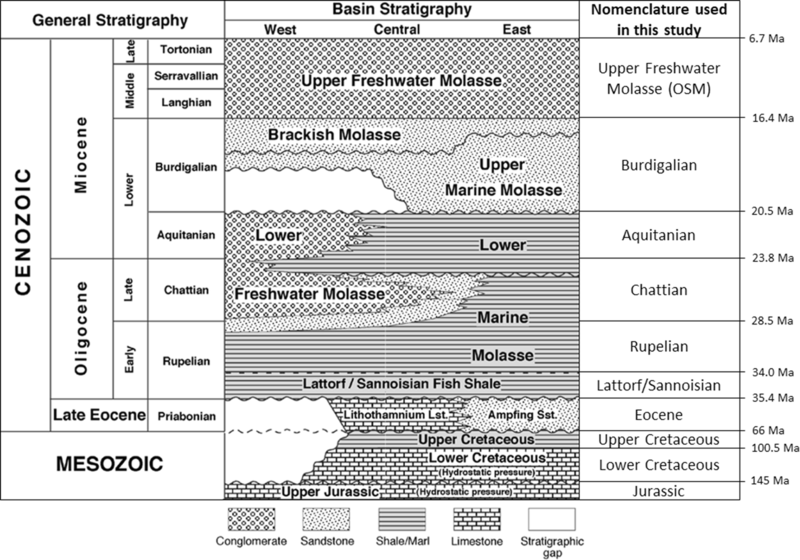 Overpressure in the Cenozoic section is usually found in Oligocene strata, in particular in the Lower Oligocene Lattorf/Sannoisian Fish Shale (Drews et al. 2018; Müller et al. 1988). In addition, Drews et al. (2018) interpreted the development of overpressure in Cenozoic sediments to be controlled by the presence of Upper Cretaceous shales retarding dewatering into the under- to normally pressured Upper Jurassic carbonate aquifer. Upper Cretaceous shales can also be significantly overpressured (Drews et al. 2018; Müller et al. 1988). However, Upper Cretaceous strata are not present in the west and northwest of the North Alpine Foreland Basin in SE Germany due to Paleocene/Eocene erosion (Bachmann et al. 1987) (Fig. 2). According to previous studies, Mid and Lower Jurassic sediments do not show any signs of overpressure (Drews et al. 2018). Although the stress regime of the North Alpine Foreland Basin in SE Germany is controversially discussed (Drews et al. 2018; Greiner and Lohr 1980; Lohr 1978; Megies and Wassermann 2014; Müller and Nieberding 1996; Müller et al. 1988; Reinecker et al. 2010; Seithel et al. 2015; von Hartmann et al. 2016; Ziegler et al. 2016), Drews et al. (2018) showed that disequilibrium compaction with the assumption of vertical stress as a proxy for mean stress is a valid model to estimate pore pressure and overpressure from shale velocities in the North Alpine Foreland Basin in SE Germany. 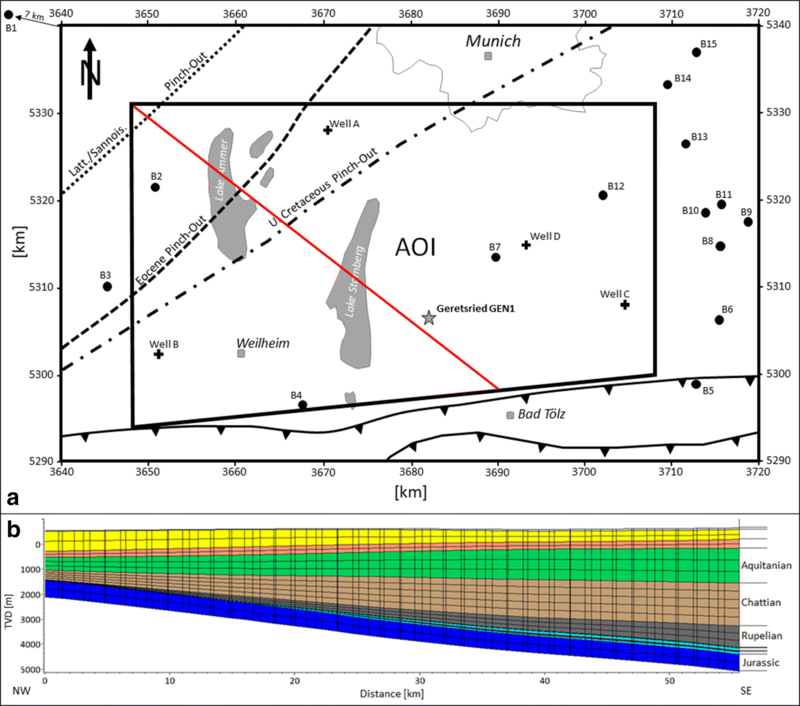 The aim of this study is to (a) investigate how a combination of velocity-based pore pressure analysis, drilling data and basin modeling can be used to predict pore pressure in the North Alpine Foreland Basin in SE Germany and (b) what are the controlling geological factors on overpressure presence and generation in the greater area around the Geretsried GEN-1 well location. The 3D basin model is calibrated to velocity and drilling data-derived pore pressure profiles of wells in the greater Geretsried area. The calibration also serves the purpose of investigating overpressure mechanisms. The Geretsried GEN-1 well is not part of the calibration, but will serve as blind test. To do so, a 1D pore pressure extraction from the calibrated 3D basin model at the Geretsried GEN-1 well location is compared to the drilling history and drilling-related pore pressure indicators of the Geretsried GEN-1 well. The deep geothermal project “Geretsried Nord” was initiated by Enex Power Germany GmbH on the Wolfratshausen concession in September 2004. The Geretsried GEN-1 well was planned as a producer and was drilled approximately 5 km northwest of the city of Geretsried from mid-January 2013 to mid-July 2013. The well reached a total vertical depth of 4852 m (6036 m in measured depth). Despite excellent temperature conditions with a bottom-hole temperature of about 160 °C, the project was halted due to a lack of productivity in the targeted Upper Jurassic (Malm) carbonate aquifer. In 2017, due to a research project, a scientific sidetrack was drilled into a nearby fault zone in hopes of increased permeability, but it did not yield a sufficient increase in productivity. In true vertical depth TVD, the Geretsried GEN-1 well penetrated approximately 70 m of Quaternary sediments, 4162 m of Cenozoic deposits, 105 m of Cretaceous stratigraphy and 515 m of Upper Jurassic carbonates (Malm). The Geretsried GEN-1 well was drilled in five sections. Figure 3 is a graphical representation of the following description of the drilling history and pressure indicators of the Geretsried GEN-1 well. In the first two sections low gas readings and a drilling mud weight of less than 1.2 g/cm3 generally indicate balanced to overbalanced drilling and likely hydrostatic pressure conditions. However, within lower Aquitanian and Chattian shale sequences increased cavings, over-pulls and tight-hole sections were recorded, which might indicate underbalanced drilling and slightly elevated pore pressures. Accordingly, maximum total gas readings of 7.1% were detected in the sands of the Lower Chattian. During drilling of the third section, the drilling mud weight was increased from 1.16 to 1.25 g/cm3 followed by a water influx within Chattian/Rupelian sands of the so called Baustein Beds at 3285 m. Recorded shut-in pressures of 17.13 MPa and a drilling mud weight of 1.25 g/cm3 indicate a formation pressure of 57.41 MPa or an equivalent mud weight of 1.78 g/cm3. 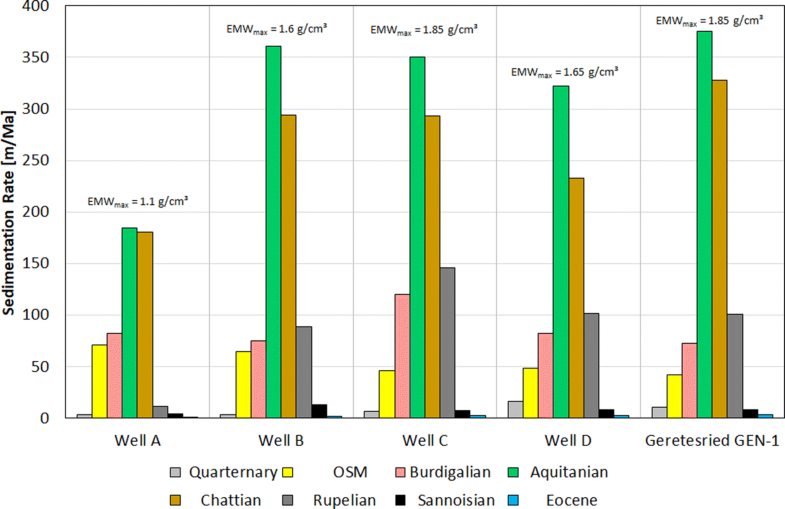 The drilling mud weight was, therefore, increased to 1.86 g/cm3 until high total gas readings of up to 49% within the Lattorf/Sannoisian fish shales and possibly Eocene required a further mud weight increase to 1.94 g/cm3, which finally stopped the increased gas readings. A formation pressure between 1.86 g/cm3 and 1.94 g/cm3 around 4115 m vertical depth is, therefore, likely. Consequently, the section was cased with a 9 5/8″ string down to 4123-m vertical depth. The followed section experienced high total gas readings and a small gas kick. Measured shut-in pressures within the Eocene Lithothamnium Limestone yielded formation pressures of 51.02 MPa or 1.26 g/cm3 in equivalent mud weight. As a result, the drilling mud weight was increased from 1.24 to 1.31 g/cm3, which stopped the gas influx. The last section was drilled entirely within the Upper Jurassic carbonate aquifer (Malm) to a total depth of 4852 m vertical depth (6036 m measured depth) with a maximum drilling mud weight of 1.07 g/cm3. However, high gas readings within the Upper Jurassic of up to 73% indicate underbalanced drilling and likely an Upper Jurassic aquifer, which is slightly overpressured and not as hydraulically active as described in other parts of the North Alpine Foreland Basin in SE Germany (c.f. Lemcke 1976). These observations fit with the low productivity rates found in the Geretsried GEN-1 well. The study area extends over an area of c. 80 × 50 km and is roughly centered by the Geretsried GEN-1 drill site approximately 30 km south of Munich (Fig. 4). The study area includes closer studied wells in the north (Well A), west (Well B), east (Well C) and northeast (Well D) of the Geretsried GEN-1 drill site (Fig. 4). Velocity and drilling data of these four wells have been studied in more detail to provide pressure calibration points for the 3D basin model. An additional set of 14 wells plus one well approximately 7 km WNW outside of the study area were used to constrain extent and thickness of the stratigraphic units included in the 3D basin model (Fig. 4). Table 1 summarizes the used well data of this study. 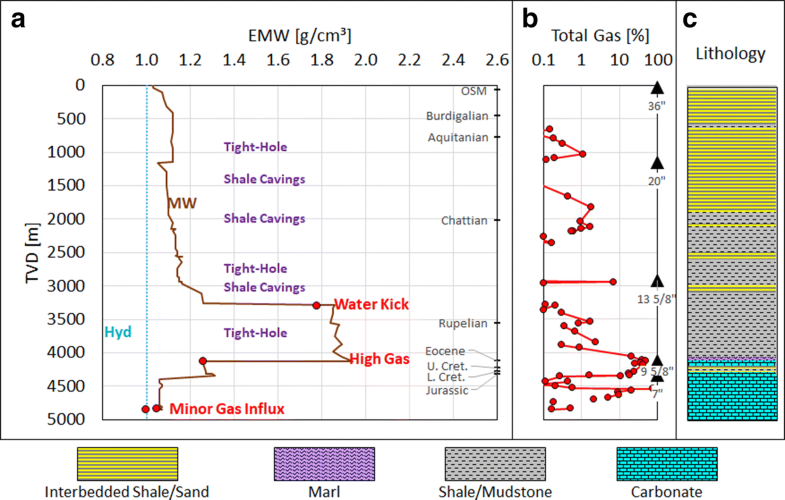 For the velocity-based pore pressure analysis of the four calibration wells A, B, C and D, available sonic log and vertical seismic profile (VSP) data were used to estimate shale pore pressure. Thereby, the workflow strictly followed the methodology and normal compaction trend developed by Drews et al. (2018), who used a combination of an Athy-porosity law (Athy 1930) modified for effective stress (c.f. Heppard et al. 1998; Hubbert and Rubey 1959; Scott and Thomsen 1993) and a porosity–velocity transform for shales (Issler 1992; Raiga-Clemenceau et al. 1988) to constrain a normal compaction trend for shales from 44 wells with normally pressured shale sections in the North Alpine Foreland Basin in SE Germany. In combination with the Eaton pressure transform for seismic velocity (Eaton 1972, 1975), the normal compaction trend can be used to estimate pore pressure in the North Alpine Foreland Basin in SE Germany. The described method requires an estimate of the vertical stress σv. Sufficient density data are neither available for the calibration wells, nor for the Geretsried GEN-1 well. Thus, the velocity–density transform of Gardner et al. (1974) was applied in those cases in which vertical seismic profile data were available for the entire well. Otherwise, an Athy-type effective stress–porosity relationship with the parameters defined by Drews et al. (2018) was used. In this study, pore pressures and subsurface stresses are usually presented as pressure/stress gradients in equivalent mud weight (EMW) with the density unit g/cm3, which is calculated as follows. where PP is the pore pressure in kPa, g is the Earth’s gravitational acceleration at 9.81 m/s2 and TVD is the true vertical depth in m, referenced to the ground level of the drill site. In Eq. 1, PP can also be substituted by any stress parameter to represent stress in equivalent mud weight. A simple 3D basin model has been set up using the PetroMod© Modeling Software 2016.2 to investigate (a) the sub-regional pore pressure distribution, (b) the impact of presence and distribution of stratigraphic units (e.g. erosion of Upper Cretaceous strata in the NW of the study area) and (c) the predictability of overpressure in the North Alpine Foreland Basin in SE Germany, using simplified basin models. The model is purely based on stratigraphic well tops from well reports of all 20 wells, hence does not include any structural elements such as faults. The individual horizons have been generated on the basis of interpolation of thicknesses of the respective stratigraphic units. In the area of interest (AOI), the resulting maximum difference between actual present-day well tops and modeled stratigraphic tops at the individual well locations does not exceed 70 m for the top Rupelian (Table 2) below the Chattian, which is the thickest stratigraphic unit (average thickness of 1200 m in the AOI) and, therefore, associated with the highest potential deviation. Facies variations within individual stratigraphic units have not been included in the basin model to keep the degrees of freedom to a minimum. Therefore, the model results represent general pore pressure trends and cannot reflect pressure perturbations due to structural or facies-related heterogeneities. A horizontal cell size of 1 km × 1 km was used. The basin model comprises 11 layers and the number of sublayers has been set such that the vertical cell size does not exceed 500 m (Table 3). The extent of the basin model is identical to the map of Fig. 4a, resulting in an 80 km × 50 km grid. Geologic ages (c.f. Table 3) for the Cenozoic section have been assigned according to Kuhlemann and Kempf (2002), except for the geological ages of the Lattorf/Sannoisian and Eocene, which have been derived from Zweigel (1998). Since the Cenozoic basin subsidence put the underlying Mesozoic strata most likely to their maximum burial depth, Paleocene and Eocene erosion has only been modeled as stratigraphic pinch-outs of the eroded strata (Fig. 4). Accordingly, geologic ages for the underlying Mesozoic strata were simply derived from the International Chronostratigraphic Chart (Cohen et al. 2013). Thus, the Mesozoic section of the 3D basin model of this study should be seen as a pre-existing basement section, while the actual basin modeling process starts with the Cenozoic basin fill. Since no lateral facies variations have been modeled, a single lithology, compaction and permeability model has been assigned to each stratigraphic unit (Table 3). Except for the shale-rich stratigraphic units (Chattian, Rupelian, Lattorf/Sannoisian and Upper Cretaceous), porosity and permeability (Table 3) have been modeled using Athy’s depth–porosity relationship (Athy 1930) and a three-point porosity–permeability relationship, respectively, with parameters for both porosity and permeability models provided by Hantschel and Kauerauf (2009). Thereby, the Neogene (Miocene and younger) sections have been modeled as permeable siliciclastic sands, while the Lower Cretaceous and Upper Jurassic have been modeled as a nearly uncompressible limestone to mimic the high permeability present in these carbonates even at depths > 4000 m (Przybycin et al. 2017). The Eocene Lithothamnium Limestone has been modeled with chalk properties to represent a fast compacting limestone. Chattian, Rupelian, Lattorf/Sannoisian and Upper Cretaceous have been modeled as shale-rich units, which are important for overpressure generation. Thereby, shale compaction (porosity as a function of effective stress) has been modeled with the same porosity trend as used for constraining the normal compaction trend of the velocity-based analysis (c.f. Drews et al. 2018). Shale permeabilities have been determined by a pore pressure calibration procedure. Thereby, the clay content-dependent porosity–permeability relationship developed by Yang and Aplin (2010) has been employed. Both the relatively thin Lattorf/Sannoisian and Upper Cretaceous shales are known to comprise the maxima in overpressure in the North Alpine Foreland Basin in SE Germany (Drews et al. 2018), suggesting very low permeability of these units. Since, at least the Lattorf/Sannoisian shale is known to be organic rich (Bachmann et al. 1987), two-phase permeability reduction offers a possible explanation for the low permeability of the Lattorf/Sannoisian and possibly Upper Cretaceous shales. Laboratory studies demonstrated that two-phase permeability of mudrocks can be reduced by > 2 orders of magnitudes compared to single-phase permeabilities (Busch and Amann-Hildenbrand 2013). To represent decreased relative water permeability due to hydrocarbon generation within these shales, permeabilities of Lattorf/Sannoisian and Upper Cretaceous shales have also been modeled using a newly developed temperature–permeability relationship. where KT is the temperature-dependent permeability in m2, T is the actual subsurface temperature in °C, Khcg is the permeability in m2 at Thcg, which is the temperature in °C, at which hydrocarbon generation is sufficient to generate a hydrocarbon saturated seal with significantly reduced water-permeability. This can be expected to start with the onset of catagenesis at temperatures between 50 and 150 °C (e.g., Bjørlykke 2015). Figure 5 shows a comparison between permeability calculations based on Eq. 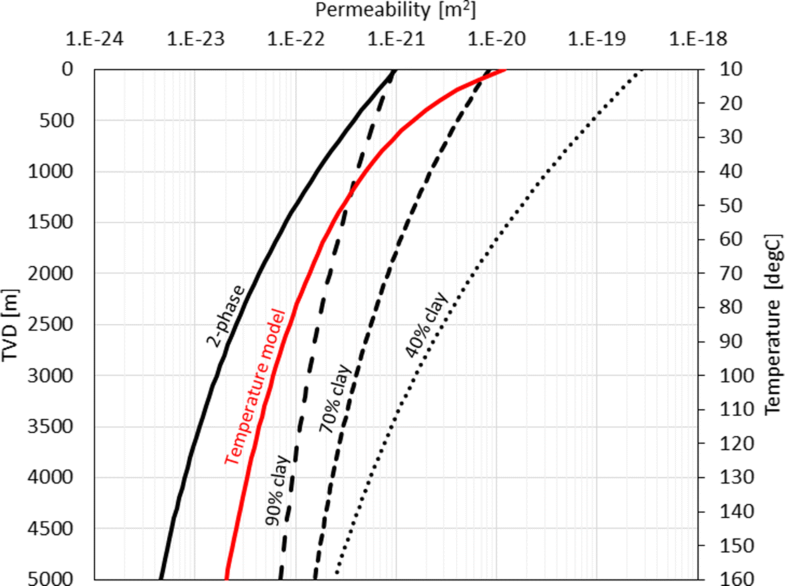 2, calculations of vertical permeability by Yang and Aplin (2010) for 40%, 70% and 90% clay content and calculations of effective permeability by applying the two-phase permeability model of Busch and Amann-Hildenbrand (2013) to the vertical permeability based on Yang and Aplin (2010) for 70% clay content. In this study, the proposed temperature-dependent permeability model (Eq. 2) is calibrated such that below temperatures of 50 °C, it yields lower permeabilities than the low-permeability configuration (90% clay content) of the model by Yang and Aplin (2010) (Fig. 5). Thereby, Khcg and Thcg are fixed to 10−22 m2 and 80 °C, respectively. The Upper Jurassic carbonate aquifer (Malm) is also known to be at sub-hydrostatic to hydrostatic pressure conditions (Drews et al. 2018; Lemcke 1976). Therefore, a permanent hydrostatic pressure boundary condition (referenced to sea level) has been set for the Jurassic. For the modeled geologic history of the study area (200 Ma to present day), a constant surface temperature of 10 °C has been applied. The basal heat flux (BHF) has been set to 53 mW/m2, which is in concordance with previous studies in the North Alpine Foreland Basin (Gusterhuber et al. 2014). Since only very little information is known about absolute paleo-sea level values and since water depth changes have no impact on effective stress, and thus present-day pore pressure, paleo-water depths were not included (zero water depth assumed for all modeled stratigraphic events). However, a sensitivity study has been performed to test the influence of extreme values for basal heat flux, paleo-water depth and surface temperature. Temperature and pressure evolution through time has been simulated using the PetroMod© Simulation Software 2016.2 without considering hydrocarbon generation and migration (c.f. Hantschel and Kauerauf 2009). The 3D basin model has been calibrated to the pore pressure gradient profiles of the wells A, B, C and D. To do so, the permeability models of the Chattian, Rupelian, Lattorf/Sannoisian and Upper Cretaceous shales have been varied, by either applying a different clay content (40%, 70% or 90%) to the porosity–permeability relationship by Yang and Aplin (2010) or using the temperature-dependent permeability function developed in this study (c.f. Eq. 2). From litho-stratigraphic analysis (Kuhlemann and Kempf 2002) and known overpressure magnitudes (Drews et al. 2018), it follows that the Lattorf/Sannoisian and Upper Cretaceous must comprise higher clay and/or organic content, and therefore lower permeabilities than the shales of the Chattian and Rupelian. From cutting descriptions also follows, that the Chattian generally comprises more sandy units than the Rupelian, and is therefore likely more permeable than the Rupelian. Incorporating these relationships by the following rule allows for significant reduction of possible permeability model combinations. where KCh, KRu, KLS, KUC are the permeabilities at a given depth of the Chattian, Rupelian, Lattorf/Sannoisian and Upper Cretaceous shales, respectively. KT is the temperature-dependent permeability defined in Eq. 2. The resulting models are then tested against the average deviation from the maximum recorded pore pressure gradients in EMW at the calibration wells A–D. Hereby, we define ± 0.15 g/cm3 as an acceptable range of average deviation, which matches the uncertainty range of velocity-based pore pressure estimates (Drews et al. 2018) and still allows for quick well control intervention in case of drilling problems. The models satisfying this average uncertainty range are then investigated further for each calibration well to find the best calibration. The calibrated basin model then represents the base case model, which is finally tested against the pore pressure profile at the Geretsried GEN-1 well location. As an initial step, the average deviation of the modeled pore pressure gradient EMW in g/cm3 from the maximum pore pressure gradients of the calibration wells has been investigated. Thereby, the impact of the Chattian and Rupelian was tested first, while the Lattorf/Sannoisian and Upper Cretaceous are set to the minimum permeability, which is given by the temperature-dependent permeability model (KT; Eq. 2). From this, it quickly follows that the permeability model of Yang and Aplin (2010) applied to both Chattian and Rupelian shales requires a minimum clay content of 70%, which reduces the number of models for the calibration routine. The upper part of Table 4 (models 1–19) summarizes the modeling rationale, simulated models for the pore pressure calibration and average pressure gradient deviations. Only considering the average pressure gradient deviation, the temperature-dependent permeability model (KT; Eq. 2) must be applied to either the Lattorf/Sannoisian or Upper Cretaceous shales to build up sufficient overpressure, except for a configuration of 90% clay content for all shale-rich units (model 17; Table 4). In the case of the Lattorf/Sannoisian or Upper Cretaceous being modeled with the temperature-dependent permeability model (KT; Eq. 2), the basin model yields overly high average overpressure when permeability of Chattian and Rupelian shales are both modeled after Yang and Aplin (2010) and 90% clay content (models 3, 18, 19; Table 4). Additional models have been run to test the impact of both the Lattorf/Sannoisian and Upper Cretaceous on overpressure build up in the study area (models 20–25; Table 4). Even, if the shale permeability of the Chattian and Rupelian is modeled with a low-permeability model (Yang and Aplin 2010; 90% clay content), the basin model yields overly low average pore pressures for higher permeability (Yang and Aplin 2010; 40% clay content) within Lattorf/Sannoisian and Upper Cretaceous shales (model 20; Table 4). The results of models 20–25 further demonstrate that a very-low-permeability unit (represented by the temperature-dependent permeability model KT; Eq. 2) in the Lattorf/Sannoisian or Upper Cretaceous is required to build up sufficient overpressure on an average basis. The total of 25 models yielded 13 models with an acceptable average deviation from the maximum recorded pore pressure gradients at the calibration wells A–D (Table 4). Further investigation of these 13 models for each calibration well shows that application of 90% clay content to the permeability model of Yang and Aplin (2010) for Chattian shales results in an unacceptable overprediction of pore pressure at Well B (Fig. 6). The calibration results also show that the maximum pore pressure gradient at Well C can only be reached in an acceptable range, if the Upper Cretaceous is modeled with the temperature-dependent permeability model (KT; Eq. 2) developed in this study (Fig. 6). Only two models satisfy the maximum pore pressure gradient deviation range of ± 0.15 g/cm3 in EMW (models 14 and 24; Fig. 6). However, in model 24, the Lattorf/Sannoisian shale permeability is represented with the highest permeability (Yang and Aplin 2010; 40% clay content), which contradicts the stratigraphic permeability relationship given by Eq. 3. Also, velocity-based pore pressure analyses of Well C in this study (Fig. 7) further indicate that the Lattorf/Sannoisian can comprise very high overpressure and, therefore, very low permeabilities. Model 14, however, provides a reasonable geological representation of permeability distributions amongst the Chattian, Rupelian, Lattorf/Sannoisian and Upper Cretaceous shales. Nevertheless, the resulting pore pressure profiles at the locations of calibration wells A–D yield a slight overprediction in the Chattian and Rupelian and underrepresentation of the Lattorf/Sannoisian overpressure (Fig. 7). In contrast to model 14, the final calibrated model (base case; Fig. 6), therefore, comprises slightly higher Chattian shale permeabilities (Yang and Aplin 2010; 67% clay content) and the very low permeability-yielding temperature-dependent model (KT; Eq. 2) for the Lattorf/Sannoisian. Especially, the latter appears to be geologically more realistic, since the Lattorf/Sannoisian fish shale has been identified as an important source rock before (Bachmann et al. 1987). Since the permeability function of Lattorf/Sannoisian and Upper Cretaceous shales of the base case model is temperature dependent, a sensitivity study was run. Based on the base case model, models with basal heat flux values of 30 mW/m2 and 70 mW/m2, a constant surface temperature of 30 °C and a paleo-water depth of 1000 m were run. According to the algorithm of Wygrala (1989), 30 °C as maximum surface water interface temperature represents the maximum for the latitude of the North Alpine Foreland Basin in SE Germany. 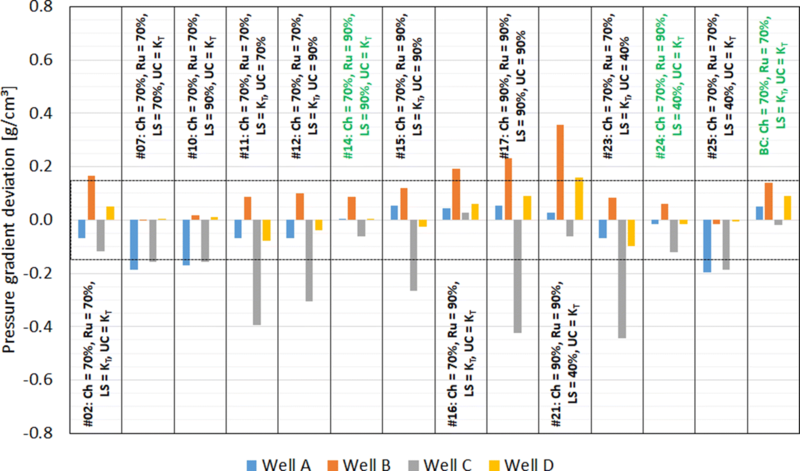 The sensitivity study shows that the impact of these parameters is fairly minimal on the estimated pressures at the Geretsried GEN-1 well location (Fig. 8a). Variation of these parameters results in stay within the acceptable uncertainty range of ±0.15 g/cm3 in equivalent mud weight. 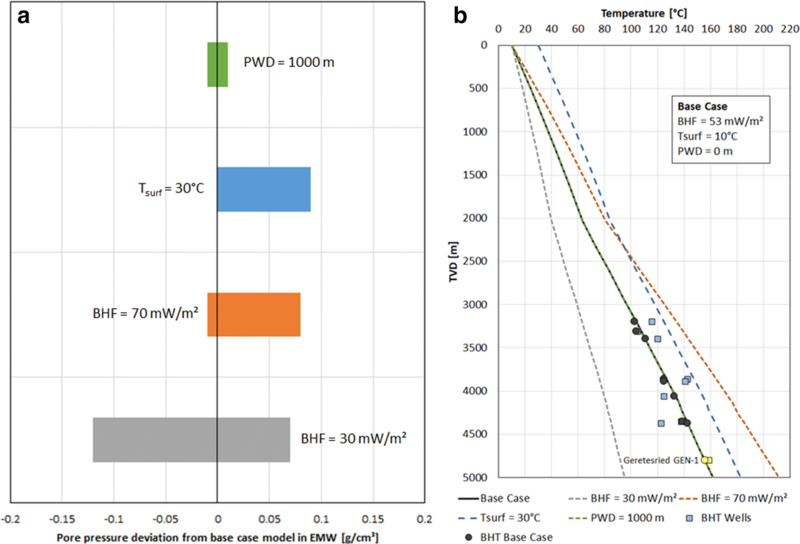 Thereby, a comparison between the modeled temperature profiles and the measured bottom-hole temperature at the Geretsried GEN-1 well location and all other wells in the AOI indicates that the values used for basal heat flux (53 mW/m2) and average surface temperature (10 °C) capture the overall temperature trend in the area (Fig. 8b). Nevertheless, it should be pointed out that it is not within the scope of this study to forecast subsurface temperatures or geothermal gradients. 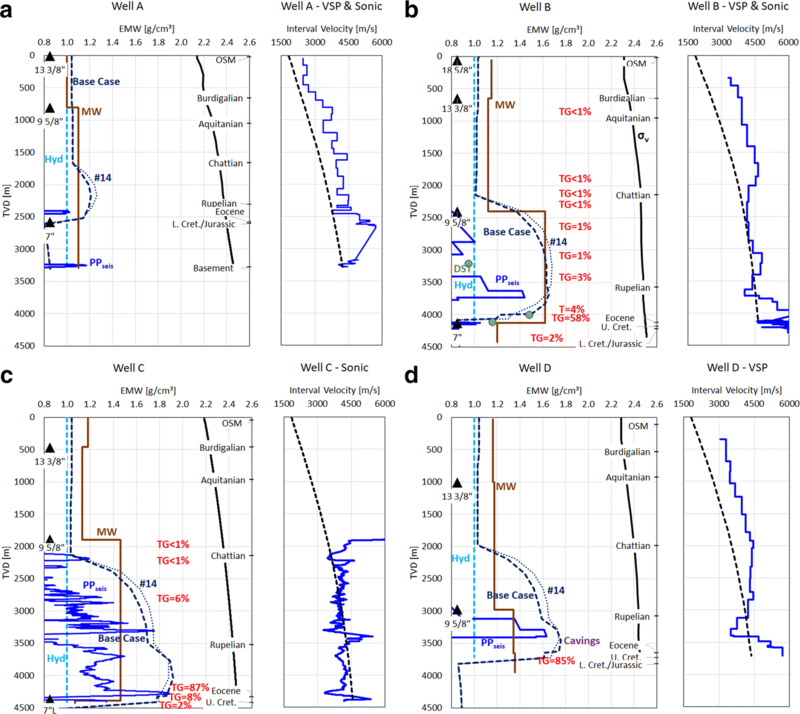 As expected, the paleo-water depth has no impact on present-day pore pressure magnitudes (Fig. 8a), since effective stress is independent of water depth. The 1D extraction of the base case basin model matches the maximum pore pressures in the lower Chattian and Rupelian within ± 0.15 g/cm3 (Fig. 9). A similar prediction prior to drilling would have avoided the severe kick at 3285 m and other drilling problems in the high pressure zone between 3250 and 4200 m. Hereby, the basin model gives an explanation of the sudden pressure increase at 3285 m: pressure likely builds already in the Chattian shales, although the onset of overpressure might be deeper if the coarser-grained units in the upper Chattian were taken into account (Fig. 9c). Although a medium gas spike of > 5% at ~ 2900 m supports overpressure build up in the Chattian (Fig. 9b), this pressure build up would have been mostly undetected while drilling. Also, a pressure estimate from VSP data does not capture the high pressure in the Baustein Beds. This might be related to different shale composition (either coarser-grained or more carbonate-rich) of the Chattian compared to the Rupelian, Lattorf/Sannoisian and Upper Cretaceous, requiring a different normal compaction trend for the Chattian to estimate pore pressure from seismic velocities. The additional influx at 4115 m recorded through high gas and subsequent drilling mud weight increase to a maximum of 1.94 g/cm3 is also reflected through the basin model extraction by a pore pressure increase in the Rupelian-to-Lattorf/Sannoisian. However, the maximum pressure predicted by the basin model is just slightly above an EMW of 1.8 g/cm3, but still within the set pressure gradient uncertainty of ± 0.15 g/cm3. Unfortunately, no VSP data were available for the Rupelian section to further validate the actual pore pressure. Within the Eocene, the basin model matches predicted shale pore pressure from VSP data. In this section, shale pore pressure is likely higher as pressure of the gas-bearing sands of the lower Eocene section, which indicates that the pore pressure regression towards the Jurassic is already starting in the Eocene. Accordingly, in the Upper Cretaceous, pressures are finally decreasing to the slightly above hydrostatic conditions in the carbonates of the Lower Cretaceous and Jurassic. This decline is also represented in the 1D extraction of the base case basin model (Fig. 9a). The 3D basin model demonstrates that for all shale-rich stratigraphic units, very low permeabilities in the range of 10−23–10−20 m2 are required to build up overpressure through disequilibrium compaction against the hydraulic pull of the under- to normally pressured Jurassic aquifer. However, such permeabilities are not unusual for clay-rich and/or organic-rich shales (Busch and Amann-Hildenbrand 2013; Hildenbrand et al. 2002; Kwon et al. 2001; Lee and Deming 2002; Luffel et al. 1993; Yang and Aplin 2007, 2010). Especially, when considering capillary sealing due to primary kerogen–hydrocarbon conversion, the resulting two-phase permeability can be reduced by up to two orders of magnitudes (Busch and Amann-Hildenbrand 2013), which might well be the case for both Lattorf/Sannoisian and Upper Cretaceous shales. A similar effect has been postulated for the Anadarko Basin, southwestern Oklahoma (Lee and Deming 2002). In this study, we mimic this effect by a continuous temperature-dependent permeability function (Eq. 2). However, a sudden decrease at the first onset of catagenesis is also a possible scenario. Nevertheless, disequilibrium compaction (eventually enhanced by capillary sealing in organic material) due to retarded water expulsion over sedimentation and burial rates is likely the dominating mechanism for overpressure generation in the North Alpine Foreland Basin in SE-Germany, which confirms hypotheses of previous studies (Drews et al. 2018; Müller and Nieberding 1996; Müller et al. 1988). The pore pressure calibration has also shown that the presence of a very low permeability (< 10−22 m2) Upper Cretaceous section is important to maintain overpressure against the Upper Jurassic hydraulic pull—in particular, at the location of calibration Well C. This is also supported by the fact that overpressure is not present at the Well A location, where the Upper Cretaceous is missing due to erosion. However, at the location of Well A, Chattian, Rupelian and Lattorf/Sannoisian shales have just reached a burial depth (1500–2500 m), where overpressure starts to build up in the North Alpine Foreland Basin in SE Germany (Drews et al. 2018). Also, maximum sedimentation rates (not decompacted) are also significant lower at the Well A location (~ 180 m/Ma; Fig. 10) compared to wells B, C, and D (~ 350 m/Ma; Fig. 10). Thereby, sedimentation rates derived from the overpressured wells B–D are even higher than previously reported sedimentation rates (Allen and Allen 2013; Zweigel 1998). Nevertheless, the rates at Well A are still high, while at the same time previous more regional studies have clearly shown that overpressure in the Cenozoic section is only present where an overpressured Upper Cretaceous is present (Drews et al. 2018), even at comparable depths and similar thicknesses of Cenozoic stratigraphic units (c.f. Kuhlemann and Kempf 2002). Thereby, the results of the Geretsried GEN-1 well showed that the drainage process and respective pressure regression already start in the Eocene in the study area. Significant changes of depositional environment of the Chattian, Rupelian, and Lattorf/Sannoisian within the study area (c.f. Fig. 4) have not been reported by respective studies (c.f. Kuhlemann and Kempf 2002). However, a general change from more terrestrial deposits in the WNW towards a pure marine setting in the ESE of the North Alpine Foreland Basin in SE Germany also impacted the regional facies distribution for the Chattian and Rupelian (c.f. Kuhlemann and Kempf 2002), which is of importance to overpressure generation on the regional scale. Therefore, lower clay content and more permeable shales might be present in the Chattian and Rupelian sections in the west of the study area compared to the east, which might result in local pore pressure deviations from the regional trend and/or impact the velocity-based analysis (e.g., compare velocity-based analyses in the Chattian of Well A to Well C in Fig. 7). To a larger extent, vertical facies/lithological variations within shales likely impact velocity-based pore pressure estimates: estimates of pore pressure from sonic logs and vertical seismic profiles at the calibration Wells A–D show both the highest variability and largest discrepancy to observed (by drilling data) and modeled pressures within the Chattian and Rupelian, which is likely indicating a vertical variability in either grain size (less clay-sized particles) or carbonate content. Both would yield higher velocities and an underestimation of pore pressure from a normal compaction trend, which is also calibrated to the more clay-rich Lattorf/Sannoisian and Upper Cretaceous shales. This is also likely to be the case for the Chattian at the Geretsried GEN-1 well location. Especially in the upper Chattian coarser-grained material has been reported by the cutting descriptions. Since the basin modeling study has clearly shown that pore pressure probably has to build up already in Chattian shales to reach present-day magnitudes, it is, therefore, likely that velocity-based analyses underestimate pore pressure at least within the lower Chattian and upper Rupelian. The water kick in the Baustein Beds (lower Chattian) at the Geretsried GEN-1 well location supports this hypothesis. The 3D basin model applied in this study does not consider any structural elements, which are abundantly present as normal faults in the entire North Alpine Foreland Basin in SE Germany. However, most of these normal faults only comprise throws on the order of 10–100 m (c.f. von Hartmann et al. 2016). Pore pressure perturbations due to hydrocarbon accumulation against these faults would, therefore, be very small and well within the range of uncertainty defined in this study (± 0.15 g/cm3). Otherwise, faults generating local pressure compartments in the Jurassic aquifer might have an impact on overpressure preservation, if these faults prevented the Jurassic from hydraulic drainage. Also, structural dip and resulting lateral pressure transfer might contribute to unexpected high pore pressure magnitudes as observed in the Baustein Beds at the Geretsried GEN-1 well location. Lateral pressure transfer has been observed in other sedimentary basins with high stratigraphic dip or structural relief (Lupa et al. 2002; Yardley and Swarbrick 2000). Based on the well data used in this study, the stratigraphy equivalent to the Baustein Beds (base Chattian or top Rupelian) is generally dipping towards the south generating a structural relief of ~ 500 m from the Geretsried GEN-1 location to the southern edge of the study area with an overall structural relief of ~ 2000 m across the entire study area. However, a study including 3D seismic data would be necessary to quantify the lateral continuity of the Baustein Beds and the possible effect of lateral pressure transfer on pore pressure magnitudes of the Baustein Beds in the greater Geretsried GEN-1 area. Finally, clay diagenesis as a secondary mechanism of overpressure generation in the study area is feasible for Rupelian, Lattorf/Sannoisian and Upper Cretaceous shales, since these units reach required temperatures in excess of 60 °C, which is the minimum onset temperature for clay diagenesis (c.f. Colton-Bradley 1987; Osborne and Swarbrick 1997). Onset of clay diagenesis has been previously reported around 2000–2500 m TVD in the Austrian Molasse Basin and Vienna Basin (Gier 1998, 2000; Gier et al. 2018). However, high-quality density data would be required to test the impact of clay diagenesis on overpressure generation (c.f. Hoesni 2004). 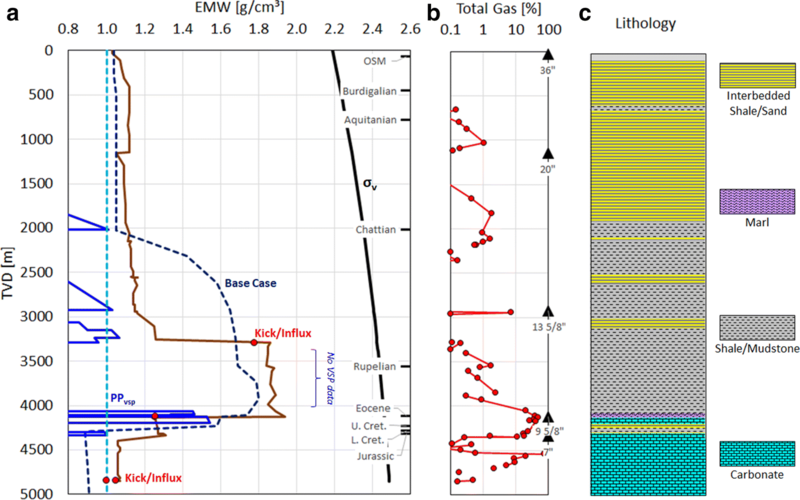 Drilling histories and velocity-based pore pressure analyses of the Geretsried GEN-1 well and four calibration wells were integrated with a pore pressure-centric (no hydrocarbon generation simulated) 3D basin model in the North Alpine Foreland Basin in SE Germany for the first time. The results of this study show that pore pressure and, therefore, overpressured zones in the North Alpine Foreland Basin in SE Germany can be predicted using simple 3D basin modeling calibrated to drilling and velocity data-based analyses of a minimum number of wells. This has great impact on future drilling for deep geothermal projects in the North Alpine Foreland Basin in SE Germany, since well design, avoidance of non-productive time and drilling safety critically depend on accurate prediction of subsurface pressures. Overpressure generation and present-day presence in the North Alpine Foreland Basin in SE Germany critically depend on (a) sufficient sedimentation/burial rates and the presence of low permeability sequences and (b) the presence and absence of low-permeability Upper Cretaceous shales, which act as pressure barrier against the hydraulic pull of the under- to normally pressured Jurassic aquifer. As a consequence, the study also demonstrates the importance of integrating different data sources with a geological model that captures the most important processes and parameters when predicting pore pressure: in this case, spatial variation of sedimentation rates and the presence or absence of low-permeability pressure barriers. Furthermore, due to lithological variability, magnitudes of overpressure in the lower Chattian and upper Rupelian are likely higher than estimated from conventional velocity and drilling data-based methods, if calibrated to a single normal compaction trend. 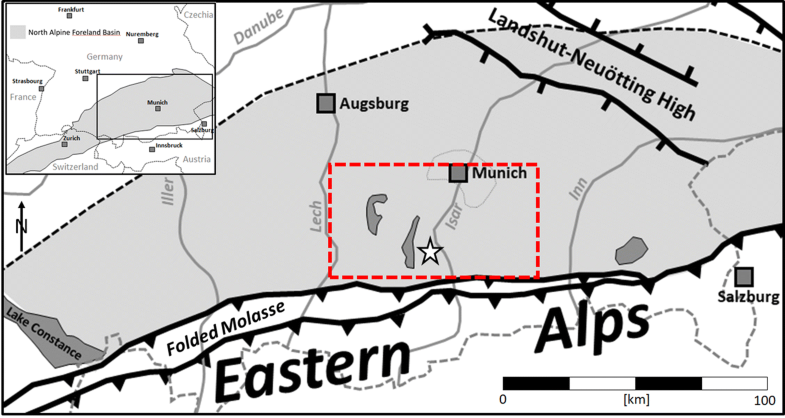 Finally, the results of this study will have great impact on future studies on the evolution and hydro-mechanical characterization of the North Alpine Foreland Basin in SE Germany, which, for example, is key to understand induced microseismicity associated with injection wells, and the local and regional stress fields. MCD designed the study, conducted the data analysis, interpretation and 3D basin modeling and wrote the manuscript. PH significantly participated in analyzing the well data and in drafting the manuscript. KZ initiated the study and together with HS participated in the writing process of the manuscript. RS and AG completed the data set and were involved in quality control of the Geretsried GEN-1 well analysis. All authors read and approved the final manuscript. First thanks go to Enex Power Germany GmbH for approval to publish data from the Geretsried GEN-1 well. The authors would also like to thank the data owners of all other wells used in this study ENGIE Deutschland AG, ExxonMobil Production Deutschland GmbH, DEA Deutsche Erdoel AG and Wintershall Holding GmbH, represented by the Bundesverband Erdgas, Erdöl und Geoenergie e.V. (BVEG). In addition, the authors would like to thank Schlumberger for providing an academic license for the PetroMod© Modeling and Simulation software and Dr. Oliver Schenk for valuable advice in the topic of basin modeling. Finally, the authors would like to thank three anonymous reviewers for their comments and suggestions, which have greatly helped to improve the structure and readability of the manuscript. The data that support the findings of this study are available from Enex Power Germany GmbH, ENGIE Deutschland AG, ExxonMobil Production Deutschland GmbH, DEA Deutsche Erdoel AG and Wintershall Holding GmbH, but restrictions apply to the availability of these data, which were used under license for the current study, and so are not publicly available. Data are however available from the authors upon reasonable request and with permission of Enex Power Germany GmbH, ENGIE Deutschland AG, ExxonMobil Production Deutschland GmbH, DEA Deutsche Erdoel AG and Wintershall Holding GmbH. This research does not involve any human subjects, human material, or human data. This work was funded by the Bavarian State Ministry for Education, Culture, Science and Arts within the framework of the “Geothermal Alliance Bavaria (GAB)” and the German Federal Ministry for Economic Affairs and Energy through the project “Dolomitkluft”.